Born: August 3, 1941, in Jersey City, New Jersey. Education: Barnard College, BA, 1963. Family: Daughter of Edward Kostyra (pharmaceutical salesman) and Martha Ruszkowski (elementary school teacher); married Andrew Stewart (attorney and publisher; divorced, 1989); children: one. Career: Monness, Williams, and Sidel, 1968–1973, stockbroker; The Uncatered Affair, 1975, caterer (cofounded company with Norma Collier); Market Basket, 1976–1979, gourmet food store manager; Martha Stewart Inc., 1977–1990, caterer; 1982–, author of food, gardening, and decorating books; Martha Stewart Living magazine, 1990–1997, editor-in-chief; Martha Stewart Living television program, 1993–2004, host; Martha Stewart Living Omnimedia, 1997–2003, chairman and chief executive officer; 2004–, founding editorial director. Awards: Daytime Emmy Awards, "Outstanding Service Show Host," 1994–1995 and 1996–1997, and "Outstanding Service Show," 1994–1995, 1998–1999, and 1999–2000; named one of "America's 25 Most Influential People" by Time , 1996; named one of the "50 Most Powerful Women" by Fortune magazine, 1998 and 1999; Edison Achievement Award, American Marketing Association, 1998; National Sales and Marketing Hall of Fame, inducted 1998. Publications: Entertaining (with Elizabeth Hawes), 1982; Weddings (with Elizabeth Hawes), 1987; Martha Stewart's Christmas, 1989; Martha Stewart's Gardening, Month by Month, 1991; Martha Stewart's Quick Cook: Two Hundred Easy and Elegant Recipes, 1992; Martha Stewart's New Old House: Restoration, Renovation, Decoration, 1992; The Martha Stewart Cookbook: Collected Recipes for Every Day, 1995. Address: Martha Stewart Living Omnimedia, 11 West Forty-second Street, 25th Floor, New York, New York 10036; http://www.marthastewart.com. ■ Martha Stewart transformed a home-based catering business into a multibillion-dollar media franchise centered upon her image as a consummate hostess, food expert, and do-it-yourself decorator. A trusted tastemaker and icon of American domesticity, Stewart skillfully cultivated one of the most recognizable and powerful brands through her award-winning television program, best-selling magazine, and more than 20books on cooking, gardening, and home decor. 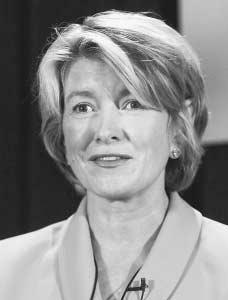 In 1997 she founded Martha Stewart Living Omnimedia, an umbrella company for her diverse publishing, television, online, and merchandising ventures. Stewart's credibility was tarnished in 2002 when she was indicted, and subsequently convicted, on four counts of conspiracy, obstruction of justice, and making false statements to government investigators, bringing the future of her company into question. The second of six children, Stewart was raised by her Polish-Catholic parents in a small, single-family home in Nutley, New Jersey, a working-class suburb near New York City. By all accounts Stewart's father was a strict disciplinarian who instilled in Stewart the value of self-sufficiency as well as a domineering perfectionism. Because of the family's modest means, Stewart and her siblings were required to perform various household chores, through which Stewart became adept at cooking, sewing, and gardening. Though acquiring these skills out of necessity, Stewart later embraced her former chores as hobbies and made a living by showing others how to parlay domestic know-how into evidence of refinement and the good life. While in high school, Stewart began modeling for upscale department stores in New York City and subsequently appeared in several television commercials and fashion magazines. Intelligent as well as photogenic—traits that would propel her career as a media star—Stewart was offered a full scholarship to New York University but declined in order to attend Barnard College, where she studied art history while supporting herself through modeling. Stewart's modeling career was given a boost in 1961 when she was named by Glamour magazine as one of America's 10 best-dressed college students. Later that year she married Andrew Stewart, a student at Yale Law School. Stewart graduated from Barnard in 1963 and continued modeling in New York while her husband established his law career. With the birth of her daughter in 1965, Stewart ceased modeling and decided to pursue an interest in Wall Street trading. Despite her lack of formal training, she landed a position as a stockbroker with Monness, Williams, and Sidel—a small firm at which she excelled and was energized by the sales environment and six-figure salary. Stewart's intuitive business sense and ambition were immediately apparent. However, an economic downturn in 1973 convinced Stewart to abandon high finance, leaving her temporarily unattached as she contemplated alternate career paths. A year earlier the Stewarts had moved from New York to Westport, Connecticut, a bucolic suburb in which they purchased an old farm house on Turkey Hill Road. Stewart turned her boundless energy to renovating the dilapidated house that would become famous as Stewart's showpiece and base of business operations. During the mid-1970s Stewart began teaching cooking classes out of her home and taking on small catering jobs, through which she quickly established a word-of-mouth reputation for excellence. In 1975 Stewart and Norma Collier cofounded the Uncatered Affair, a catering business that flourished despite tensions between Stewart and Collier, who resented Stewart's overbearing work style. Over time many of Stewart's business associates and employees would accuse her of being overly demanding, manipulative, and verbally abusive, presenting a seemingly irreconcilable foil to her public persona as a warm and charming hostess. While Stewart's lofty standards and meticulous attention to detail were keys to her success, they also incurred significant personal costs, including the breakup of her marriage in 1989. After parting ways with Collier, Stewart was hired as the manager of Market Basket, a gourmet food court in a small Westport shopping mall, which she transformed into a booming success. Stewart simultaneously developed her own catering business, Martha Stewart Inc., impressing her celebrity and well-to-do clients with elegant menus and creative presentations that featured her homegrown ingredients and distinctive personal touch. Displaying a knack for self-promotion, Stewart enhanced her reputation by pitching stories about her work and home to local newspapers and by contributing occasional articles on food, gardening, and home decor to such national magazines as Good Housekeeping, House Beautiful , and Country Living . In 1979 Stewart received a $25,000 advance from Crown Publishing to write her first book, Entertaining , hiring the free-lance writer Elizabeth Hawes to assist her. The finished product, a lavish cookbook and decorating guide embellished with photographs of Stewart's immaculate Turkey Hill home and table settings, was published in 1982. This best-selling book established Stewart's trademark aesthetic—genteel sophistication merged with casual intimacy and everyday practicality—and catapulted her into the media limelight with a national book tour, speaking appearances, and television interviews. Over the next several years, Stewart published additional food books and a popular wedding planner that extended her name recognition and provided the foundation upon which the Martha Stewart "brand" was built. In 1986 she made her debut as a featured television hostess on "Holiday Entertaining with Martha Stewart," a public television special in which she cheerfully prepared a sumptuous, home-cooked Thanksgiving dinner for her family. The success of the program, which Crown Publishing distributed as a mail-order video, encouraged Stewart to set her sights on additional television opportunities. In 1987 Stewart signed a lucrative contract with the discount retailer Kmart to serve as the company's lifestyle consultant. While helping Kmart elevate its down-market image by endorsing and promoting an exclusive line of home products, Stewart received valuable national exposure through Kmart's expansive advertising campaign and attracted a growing following of admirers. A long-lasting and highly profitable relationship for Stewart, she continued to sell her popular "Martha Stewart Everyday" products in Kmart stores through 2004. During the late 1980s Stewart sought to capitalize on her growing fame with a new lifestyle magazine based on the same entertaining and decorating concepts in her best-selling books. In 1990 she convinced Time Warner to publish the magazine Martha Stewart Living , which was an instant success and paved the way for subsequent celebrity-based women's glossies, such as Oprah Winfrey's O and Rosie O'Donnell's Rosie . The next year Stewart signed a 10-year contract with Time Warner for the magazine and spin-off television programs, videos, and books. Stewart's Time Warner deal also included regular appearances on the NBC morning program The Today Show , which enlarged her fan base and provided a prominent cross-promotional platform for her publications. Stewart's keen entrepreneurial instincts included an ability to understand the advantages of "synergy," a business concept that became popular during the 1990s as such media corporations as Time Warner became increasingly consolidated. Synergy occurs as a product or line of products is marketed cooperatively across multiple advertising and media outlets so that the sum of the various outlets—for example, television, publishing, and retailing—provides greater marketing power than any one medium in isolation. In Stewart's case, her relationships with both Time Warner and Kmart provided opportunities for promoting her publications and products in interrelated news programs, television and magazine features, advertising campaigns, and sponsor tie-ins. In 1993 Stewart launched a television version of her magazine, also titled Martha Stewart Living , which was produced through a subsidiary of Time and syndicated throughout the country. The program initially aired as a weekly, half-hour series but was soon expanded into a daily, hour-long show as a result of its enormous popularity. With Stewart as the show's wholesome host, the series became one of the most watched morning programs among female viewers and earned several Emmy awards before it was discontinued in 2004. In 1997 Stewart leveraged her profits from Kmart to buy back her magazine from Time Warner for an estimated $75 million. At the same time, she founded a new company, Martha Stewart Living Omnimedia, over which she presided as chairman and chief executive officer. Martha Stewart Living Omnimedia would serve as the parent company of her various media holdings, including Martha Stewart Living magazine and a series of derivative "Best of Martha Stewart Living" books; the spin-off magazines Martha Stewart Weddings, Martha Stewart Kids , and Food Everyday ; her television program, daily radio show, Web site, and syndicated newspaper column called "Ask Martha"; and a mail-order catalog business, Martha by Mail. Stewart caused a major stir on Wall Street when she took her company public in an initial public offering in October 1999. Stock prices for Martha Stewart Living Omnimedia skyrocketed, and Stewart, owner of 60 percent of the company's shares, amassed paper assets worth more than $1 billion almost overnight. In 2000 Martha Stewart Living Omnimedia reported profits in excess of $21 million with annual sales of over $285 million. The company continued to grow and prosper over the next two years. As a result of the investigation and the intensifying scandal, Stewart relinquished her seat on the board of directors of the New York Stock Exchange in late 2002. On June 4, 2003, Stewart and Bacanovic were officially indicted by a federal grand jury on nine counts of securities fraud, obstruction of justice, and conspiracy—serious criminal charges that carried prison sentences. Though vigorously denying the allegations and defending herself on her Web site and in a paid, full-page editorial in USA Today , Stewart stepped down from her position as chairman and CEO of Martha Stewart Living Omnimedia on the day of her indictment. She subsequently inserted herself into a newly created position, founding editorial director, from which she continued to head the company. Amid a media frenzy, Stewart's trial began in a Manhattan courtroom on January 20, 2004. Stewart refused to testify but maintained her innocence throughout the proceedings, despite witness testimony as well as evidence of doctored documents suggesting foul play. Her prior experience as a stockbroker precluded the possibility of arguing that she was ignorant of trading regulations. On March 5, 2004, Stewart was convicted of four counts of obstruction of justice and lying to investigators. On July 16, 2004, Stewart was sentenced to five months in prison, followed by five months of house arrest. She remained free on bail pending an appeal. Stewart built a media empire and a world-class brand through her superior aesthetic sense and ability to present herself as a living embodiment of simple elegance. During the 1980s and 1990s her quick tips for fine cooking and better decorating appealed to many American women—traditional as well as professional and liberated women—who sought to emulate Stewart's gentrified version of modern homemaking. Instructing her audiences from the staged comfort of her renovated colonial home and beautifully maintained gardens, Stewart showed how sophisticated cuisine and understated home luxury were not the exclusive domain of upper-class New Englanders but were accessible to anyone willing to heed her recommendations. Stewart's judicious taste was encapsulated in her trademark epithet "It's a good thing." Part of Stewart's business success can be attributed to her realization that she was selling not only products but also information. Her publications and television series were popular because the information Stewart provided was perceived as consistently reliable and useful by her audience. Moreover, she conjured an idealized home life that demonstrated how time-strapped, modern working women could have it all. In contrast to such staid predecessors as Betty Crocker and Julia Child, Stewart represented a thoroughly modern woman—smart, ambitious, and attractive—whose judgments on food, home decor, and style became the unofficial equivalent of the Good Housekeeping seal of approval. By distilling this authority into a powerful brand, Stewart was able to expand into new product lines—from paint to bedding to stationary—on the strength of her name and endorsement alone. Despite her remarkable business accomplishments and rise as a major player in the male-dominated media industry, Stewart was often the subject of scorn and ridicule. Mocked for her cloying graciousness and condescending explanations of difficult recipes and projects that she performed with effortless perfection, she was also accused in numerous published accounts of displaying a cruel temper and brazen selfishness. It is worth noting, however, that criticism of Stewart's aggressive personality and tendency to micromanage her business suggested a double standard, as these same traits were often deemed praiseworthy in male executives. Stewart's complex identity as a business leader and celebrity had serious implications for Martha Stewart Living Omnimedia in the wake of her conviction. Because of Stewart's status as the irreplaceable core figure of the company, the fate of her media enterprises—and her own reputation as a pathbreaking entrepreneur—rested heavily upon her continuing popularity in the face of a notoriously fickle public. See also entry on Martha Stewart Living Omnimedia L.L.C. in International Directory of Company Histories . Brady, Diane, "Martha Inc.: Inside the Growing Empire of America's Lifestyle Queen," BusinessWeek , January 17, 2000, pp. 62–69. Byron, Christopher M., Martha Inc.: The Incredible Story of Martha Stewart Living Omnimedia , New York: John Wiley, 2002. Crossen, Cynthia, "Martha Stewart Living: Fantasies for $3," Wall Street Journal , March 28, 1991. Fine, John, "Martha's World," Advertising Age , October 16, 2000, pp. 1–3. Hales, Linda, "Living Large: Martha Stewart's Global Recipes," Washington Post , January 23, 1997. Hays, Constance L., "Imagining Business without Stewart," New York Times , March 12, 2004. ——, "Stewart Quits Her Post at Company," New York Times , March 16, 2004. Henriques, Diana B., "The Cult of Personality vs. Needs of the Market," New York Times , October 12, 1999. Oppenheimer, Jerry, Martha Stewart—Just Desserts: An Unauthorized Biography , New York: William Morrow, 1997.